I thought it was a good match. I thought both teams were playing very similar at the beginning of the first game and parts of the second game. I thought the key for us was our defense was so good. We didn’t give them any easy kills at any point of time. These two (McClendon and Scott) had a good night offensively. Deja (McClendon) passed and served well. For us to have success, we need everybody to do certain things. I thought Megan Courtney blocked well. We got good help off the bench, and it was a good team victory for us. 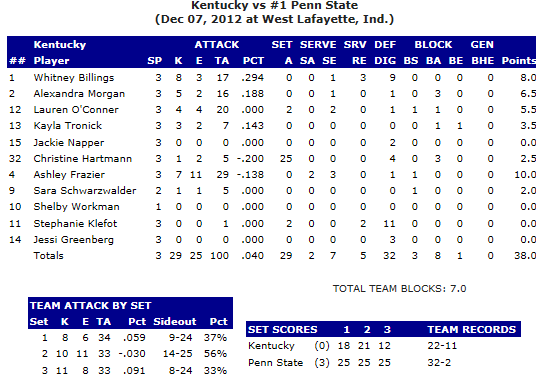 In the first set of Penn State’s 3-1 (25-18, 25-21, 25-12) win over Kentucky, when a kill by Kentucky’s 6-2 Jr. OH Whitney Billings made the score Kentucky 13, Penn State 9, at least some viewers had to be questioning Penn State’s #1 overall seed in the NCAA Women’s Volleyball Tournment. Not to worry, ye of little faith. 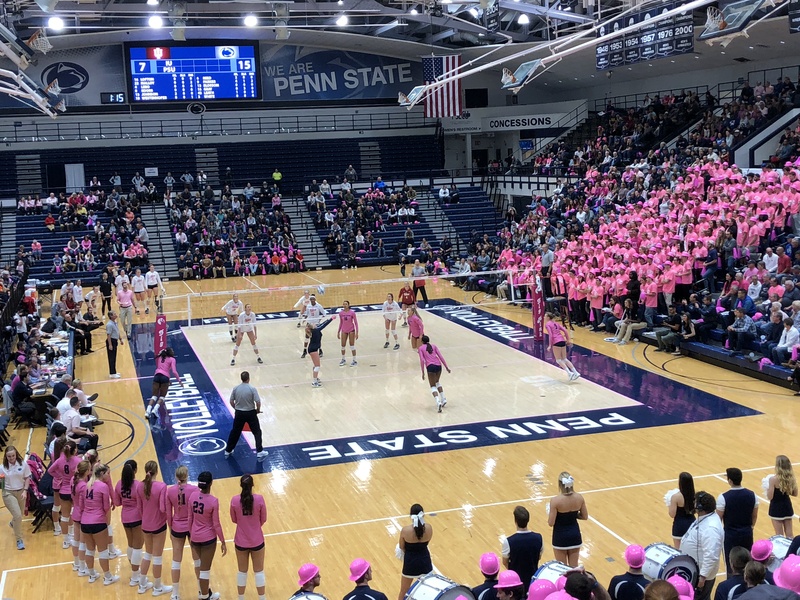 Penn State’s 6-1 Jr. OH Deja McClendon broke Kentucky’s four-point run with a kill, followed that with another, and 5-6 Sr. DS Kristin Carpenter followed those two kills with a service ace, as Penn State bounced back with a 16-5 scoring run of its own. With the win, the Nittany Lions advance to the Regional Finals on Saturday, December 8th, where they will face Big Ten rival #8 seed Minnesota at 4 p.m. ET. The match will be televised live on ESPNU. It was a solid team effort, as 6-4 Jr. Opp/RS Ariel Scott’s 11 kills were tops for the match, followed by Deja McClendon’s eight kills (and 10 digs). 5-11 So. S Micha Hancock totaled 28 assists, 7 digs, and 2 service aces, and 5-6 So. L Dominique Gonzalez led both teams with 12 digs. 6-6 Jr. MH Katie Slay recorded 5 blocks and Big Ten Freshman of the Year, 6-2 OH Megan Courtney, added four (including 1 solo block, giving her a team-leading 28 for the season — Katie Slay is second on the team with 18). Kentucky’s Whitney Billings was the leader for the Wildcats, with 8 kills and 9 digs, hitting .294 for the match — by far the best performance for Kentucky, which hit .040 as a team, as it finished its season at 22-11. Hats off to Penn State, they were awfully good tonight,” Skinner said. “I thought they played better tonight than they had the past couple of weeks. The margin of error is pretty small when you get to this point in the tournament … You really need to get one of those first two games to go in the locker room with a little bit of momentum. “For us to out dig them by 10 digs was really important. We thought the key for us was that our defense needed to match their defense because we saw them play last year and that was the last time I had seen them play live. They were hosting a regional, and they played great against Texas. So, we knew that their defense of intensity was going to be very high. (Coach Craig) Skinner does a great job. Kentucky beat a very good Ohio State team that competed very hard in our conference, so we knew that we would have to do certain things in order to have success. Kentucky serves well. They are big at the net and are a very athletic team. Certainly Morgan and Billings next to each other is a very big block. (Lauren O’Conner) is a large block when she is blocking by herself. We needed to try to control the ball and we needed to try to find some seams, but what we really needed to do was we had some things in the game plan that I thought players did a really nice job with. I don’t think we did anything to take them away. I mean that’s the first time I saw them play. I thought they both took some great shots and they have good range. They may have made more mistakes than they typically make, but that’s what happens when the other team is causing you problems and I am sure that is what Kentucky does to a lot of people throughout the year. Their defense is their strength. 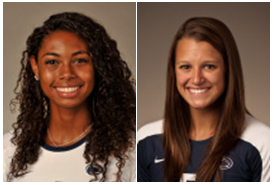 But, we felt that Ariel Scott was going to get her kills, and we needed Deja (McClendon) and Megan (Courtney) to take some good swings out there. We thought we could get some swings out. Well, I mean the good news is we don’t have to spend a lot of time on the scouting report because all the teams are familiar with each other, but it’s how you play and not who you play. And we have had some very tough matches with both of those teams. From my stand point, you don’t really care who you play, you just hope your team plays well and if your team plays well, then you hope you have success. And if the other team plays better, then as disappointing as that might be, you recognize it’s a conference school and everyone in the Big Ten cares and everybody is well coached and there is a great talent level across the board of all the Big Ten Teams. I hope everybody in the Big Ten roots for the Big Ten teams. 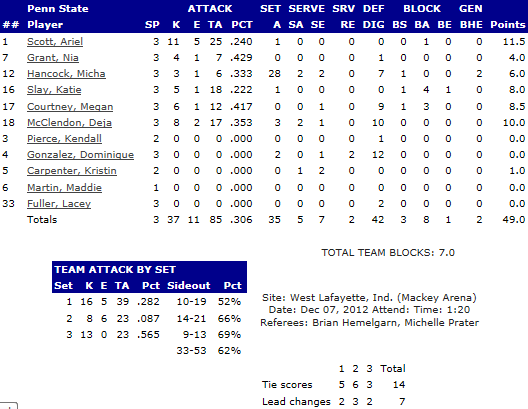 I definitely think we passed well in the second and third sets, which really helped us. When we pass well, we have a pretty good offense. So we were a little bit worried about the passing, but Dom Gonzalez] and a couple of the other people picked it up and they ended up doing a really good job. I definitely think going further in the tournament I am going to have to keep my errors down, my hitting errors. But we got the jitters out so I think we are okay with that. We are usually pretty good at keeping our errors down. Serving and passing was really good today, so that helped me out a lot. It’s definitely tough to play against your friends but we are all fighting for the same thing and I really want us to win. It’s just nice that we go out there and play tough. Meg also knows a couple of the girls, so we just struggle with that.